UPM Raflatac has globally launched a renewed portfolio of innovative home care film label materials. 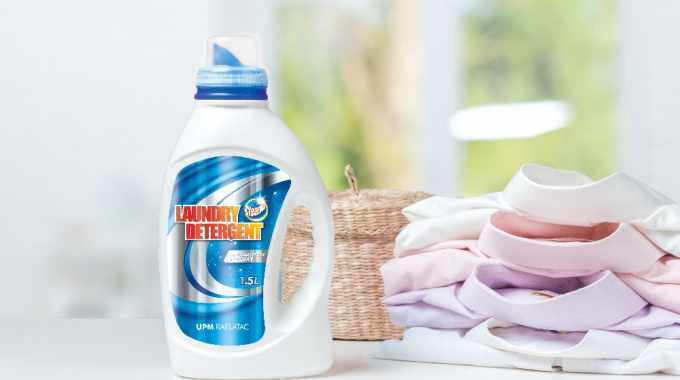 Whether a brand specializes in laundry care, surface care, dishwashing liquids or home insecticides, UPM’s materials offer consistent performance and ensure that products stand out on the shelf. Brand loyalty in the home care segment is important to many consumers and a label is a brand owner's best chance at making a first impression that could generate a customer for life. But those labels have to perform well, time after time, even though they are often used in damp or wet environments and experience content spillage. UPM Raflatac's superior labeling solutions will consistently meet brands' needs - from rigid, to conformable and squeezable, large bottles and even open closure with resealable functionality. UPM Raflatac's home care line includes a wide range of ecodesigned products that can enable them to meet consumer demand for sustainable packaging materials; reduce waste, water and energy usage; and promote a circular economy. This includes innovative products like UPM Raflatac's Association of Plastic Recyclers-recognized wash-off labels with RW85C adhesive for PET containers and Vanish PCR, a clear film with a 90 percent recycled content face - a global first for sustainable packaging.